Item # 309706 Stash Points: 1,395 (?) This is the number of points you get in The Zumiez Stash for purchasing this item. Stash points are redeemable for exclusive rewards only available to Zumiez Stash members. To redeem your points check out the rewards catalog on thestash.zumiez.com. Get excited to create new daily looks with HUF's Plantlife Green Buddies 2 Black Crew Socks. These plush socks are featured with jacquard knit green weed leaf monsters throughout, accompanied by signature logo script in contrasting white; a lighthearted aesthetic that helps provide your personal style a fun, creative perception. 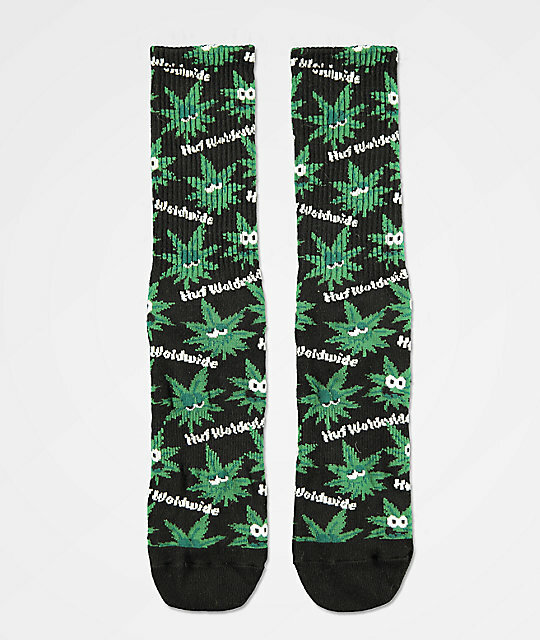 Plantlife Green Buddies 2 Black Crew Socks from HUF.